Palestinian nasi in the first half of the tenth century. His name was brought to light some twenty years ago by several fragments discovered in various genizoth. The fragments contain an account of a controversy on the calendar between Ben Meïr and the academies of Babylon. Introducing a new rule in the fixation of the "Molad" of Tishri, Ben Meïr had decreed that, in the year 922, Passover and the other Jewish feasts should be celebrated two days before the date prescribed by the traditional calendar. Saadia, who was at that time staying at Bagdad, joined his protest to that of the Babylonian academies. Ben Meïr, however, refused to yield to their injunctions, denying them any authority in astronomical matters; and, owing to his own reputation and that of his family, won the confidence of Jews in many countries. A letter was then addressed by the exilarch David ben Zakkai and the Babylonian notables to Ben Meïr, imploring him not to cause a schism and showing him the fallacy of his calculations with regard to the calendar. 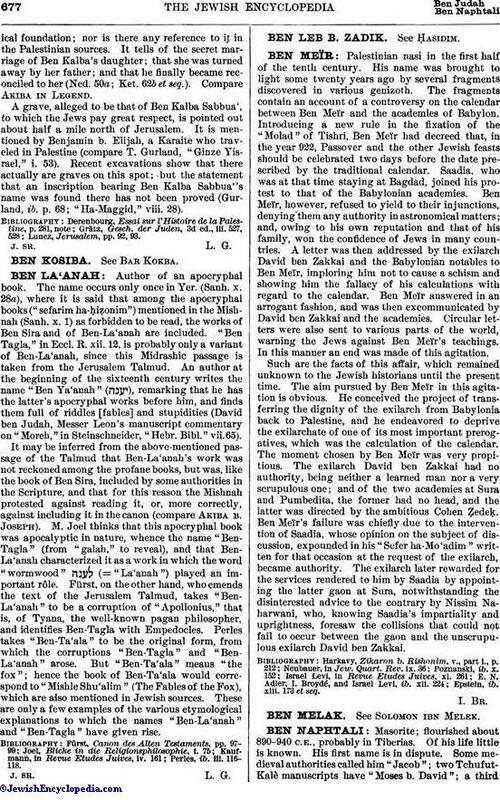 Ben Meïr answered in an arrogant fashion, and was then excommunicated by David ben Zakkai and the academies. Circular letters were also sent to various parts of the world, warning the Jews against Ben Meïr's teachings. In this manner an end was made of this agitation. Such are the facts of this affair, which remained unknown to the Jewish historians until the present time. The aim pursued by Ben Meïr in this agitation is obvious. He conceived the project of transferring the dignity of the exilarch from Babylonia back to Palestine, and he endeavored to deprive the exilarchate of one of its most important prerogatives, which was the calculation of the calendar. The moment chosen by Ben Meïr was very propitious. The exilarch David ben Zakkai had no authority, being neither a learned man nor a very scrupulous one; and of the two academies at Sura and Pumbedita, the former had no head, and the latter was directed by the ambitious Cohen Ẓedeḳ. Ben Meiuml;r's failure was chiefly due to the intervention of Saadia, whose opinion on the subject of discussion, expounded in his "Sefer ha-Mo'adim" written for that occasion at the request of the exilarch, became authority. The exilarch later rewarded for the services rendered to him by Saadia by appointing the latter gaon at Sura, notwithstanding the disinterested advice to the contrary by Nissim Naharwani, who, knowing Saadia's impartiality and uprightness, foresaw the collisions that could not fail to occur between the gaon and the unscrupulous exilarch David ben Zakkai. Epstein, ib. xlii. 173 et seq.